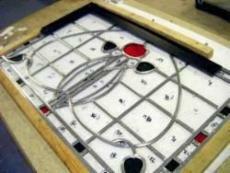 Stained glass reproduction main door window. A design for the front door was made to compliment the existing side panels for this Cardonald home. The glass used was made to match as close as possible to the original. Hand made pink Lamberts glass was used to make the central flower motif. 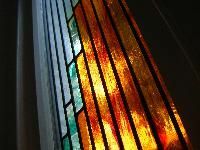 This stained glass window was designed using elements of local relevance to the client, local maps and to the windows of Frank Lloyd Wright. 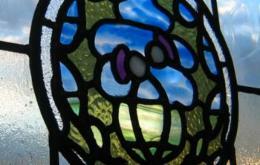 Details from the clients own photography were painted into small sections of the glass. The white Lamberts glass turns to a light amber when viewed directly into light. 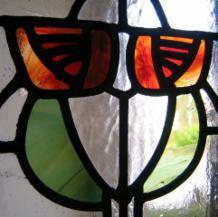 Stained glass Thistle door panel. Edinburgh. 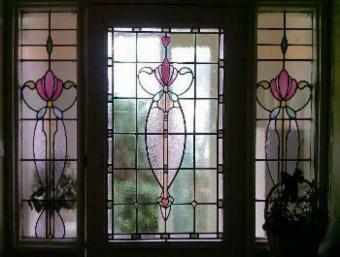 Transom light leaded panel for above a door in this Hyndland, Glasgow home. Left. 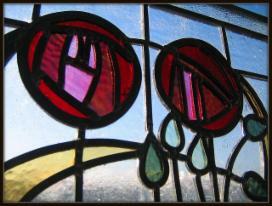 Stained glass detail. Glasgow Rose. Middle section of 15 small panels which made up this glasgow front door. 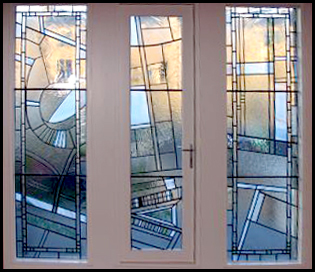 Stained glass front door and windows for this East Kilbride home. Designs taken from architects drawings. ATA Studio. 2009 Glasgow Institute of Architects design commendation.